Inside the box-like, grey-clad stringer manufacturing building at Airbus UK’s Broughton site in North Wales, there is a smaller grey box that is part of a £7 million-plus investment for stringer machining. It represents state-of-the-art stringer production efficiency and brings together a DS Technologie Ecoliner 5-axis horizontal machining centre (with a 24 m x-axis) and novel Roemheld fixturing designed by Fraunhofer Institute of Production Technology at Aachen University, Germany. These support a single set-up, two-operation process that has slashed machining times by some 40 per cent over previous methods. Stringers are one of three main structural components in an Airbus aircraft wing: two spars that run longitudinally from root to tip of a wing, (plus a third spar in the centre on larger aircraft) ribs that run from front to back which are connected to the spars, much like rungs on a ladder and the stringers that connect the wing skin panels to the rib/spar structure. They also give stiffness and form to the skin as they run longitudinally from root to wing tip. Stringers are first machined and then formed to shape. The new 22,000 m2 stringer facility at Broughton was formally opened in January 2003 as part of a £73 million investment in wing skin manufacturing. It is focused on the manufacture of parts for the new A380 aircraft, although stringers for all Airbus variants are also made there. The stringer machining facility has been operational in the new building since January 2004. The A380 is the world’s largest passenger airliner and its wings are also the largest. They are, in fact, over 45 m along the leading edge from fuselage to wing tip and, at the point where the wing joins the fuselage, the ‘root end’, it is 2.4 m high. There are 31 stringer positions on the underside of a single wing and 30 on the top. However, each postion may be composed of several discrete stringer lengths. The maximum stringer length is dictated by the length of extrusion that can be supplied. Broughton manufactures the majority of the complex bottom stringers itself – around 120 out of 200 per wing set. The remainder are supplied by CAV Aerospace, Consett. A380 bottom stringers made at Broughton range from 20 m long down to around 3 m. (The shortest, at 0.7 m, is a top stringer which is made by suppliers.) The stringers are made from a 2000 series aluminium alloy and have a capital T shape cross-section that is between 3 mm and 10 mm thick. The current rate of production is around 20-off A380 aircraft sets/year, with this expected to ramp up further next year. That increasing rate is seeing some adjustment to the number of different types of stringer tackled in-house, so Broughton will concentrate on the longer stringers and place some shorter ones with outside contractors. The new facility provides a manufacturing solution that is both faster and better than the previous method. This uses two DS Technologie machines, again with Roemheld fixturing, which are still employed at Broughton, and was itself a massive improvement on previous practice. At the end of the 1990s, the company decided that it wanted a single operation not five. This was achieved with two DS Technologie Ecoliner machines plus Roemheld fixturing, like the latest installation. With these the operation sequence was reversed with the main top features, or ‘old’ operation two, performed first. 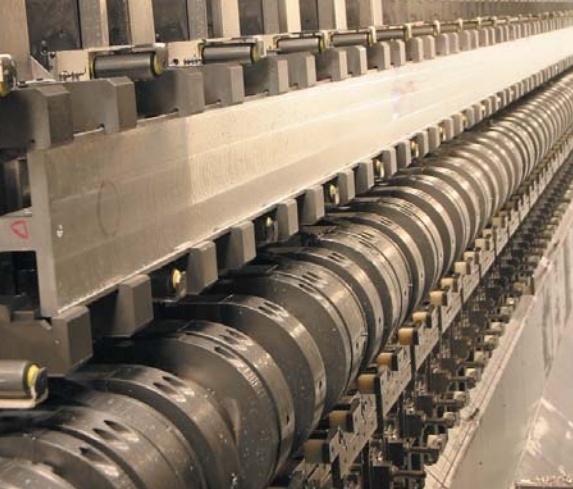 Extrusions are automatically fed into the machine/fixture loading arms then rotated to move the extrusion into a position where it is located on the socalled slab-face with arms securing it by locating on the underside of the T bar, out of the machining area on extra material. The fixture is not adjusted for different parts all raw material extrusions are accommodated. “Once all the top features have been machined, fixture transfer arms turn the part through 180° so that the slab surface that makes contact with the skin is machined with all its steps, shallows, ramps and tapers. Then the final profile is machined,” explains Mike Power, former product unit manager. When this final profile is created, the part is held by the central upright, the pads that were pushing down on the top of the T bar having had to be lifted to allow the cutter to pass. So a single set-up, two operation process replaced the former five-operation approach using an automated fixture system able to receive raw material and locate in to two positions to achieve complete machining. This first change to a DS Technologie/Roemheld set-up saw machining times per metre fall from 40 min to around 25 min and also allowed the company to move away from batch manufacture to single-piece flow, allowing a massive reduction in work in progress and stock. The latter built up if, for example, a single replacement part was needed but a batch had to be manufactured resulting in the surplus parts going into stock. But like any process, especially at a first iteration, things can always be improved and so it was with the latest machine for A380 stringers. This meant back to the drawing board for the machine manufacturer. With fixturing on the first project being the most difficult element, DS Technologie additionally took control of the fixture part of the order (it had been subcontracted before) and brought in Germany’s Aachen University to provide the necessary design input to ensure the Roemheld component based workholding system would perform well from the outset and allow the project to be delivered on time. In the event it was delivered one month early. Although the latest system still employs a fixturing system that repositions the work pieces in two positions 180° apart, it is a completely different design. The latest installation has also seen Airbus move back to the original process order with the slab surface machined first, but with a novel approach to profile machining. “The change has given us two key benefits the dimensional stability of the thickness of the stringer base – the critical area where the skin, stringer and rib join and which defines the aerodynamic shape of the wing – has been improved. Achieving this on the first machines required a lot of probing and checking,” Mr Williams explains. “This third machine supports this new regime economically,” adds Mr Power. So this latest method not only achieves better dimensional stability, but also further reduces machining time. Because there is less material being converted to swarf to achieve the finished profile, cycles now average 15.5 min/m. And this approach has actually brought an unexpected bonus in scrap material value, says Mr Power. “The value of solid waste is some 50 per cent greater than for loose swarf.” With less swarf the potential for swarf-related problems is also reduced, he adds. Airbus UK’s Broughton state-of-the art stringer machining facility will represent the height of technology for many years to come. With over 4,200 Airbus aircraft delivered over the last 35 years, and a forward order book for 2,100 more – around five years’ work at current rates – Airbus is clearly determined to maintain its technological lead in the aviation market.